Over the past decade organizations have faced relentless customer demand for better value at less cost, individual customization, greater choice, faster delivery, higher quality, exceptional service, and more recently – increased environmental and social consciousness. The organization’s weapon of choice to address this increasing demand has been the supply chain. However, as the supply chain footprint changed (e.g. outsourcing, off-shoring and customer/vendor empowerment) so did the organization’s exposure to uncertainty. Organizations were taken by surprise since this exposure was unanticipated, complex and beyond their ability to manage. As customers become more demanding and change occurs at an even greater pace, supply chain risk continues to propagate like a parasite. Organizations and societies are at much greater risk of systemic failure because of the massive interdependency throughout global supply chains. The priority now is two-fold; play catch-up and address these massive gaps while deploying more intelligent and integrated strategies (i.e. social aware, instinctive, dynamic and predictive) for dealing with continuous change. 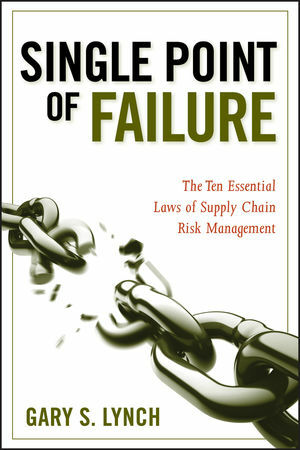 Single Point of Failure: The 10 Essential Laws of Supply Chain Risk Management uses analogies and dozens of case histories to describe the risk parasite that infects all supply chains while revealing methods to neutralize that parasite. The book addresses the questions: What are the "single points of failure"? How exposed are customers, investors, other stakeholders and ultimately the organization? What is the measurable impact (i.e. brand, financial, strategic, and non-compliance)? Who establishes the "risk paradigm"? How does the organization efficiently and effectively allocate precious resources - time, people, management attention, and capital? How is success measured? This book is both technically powerful and effectively realistic, based on today's complex global economy. GARY S. LYNCH, CISSP, is an Author, Managing Director and Global Leader of Marsh's Supply Chain Risk Management Practice. He has contributed to the World Economic Forum (WEF) Global Risks Report, been a speaker on pressing global business risk issues for organizations such as Asia Pacific Economic Cooperation (APEC/Singapore & Australia), Risk and Insurance Management Society (RIMS), the World Customs Organization (WCO/Brussels), and The Wharton School, Center for Risk Management and Decision Processes. He also leads Marsh's Global Pandemic Response Center. He works as a management consultant, specializing in helping senior executives solve complex business risk issues. He has developed critical thought leadership and solutions around emerging risk issues, including supply chain risk management and financing, information protection strategies and schemes, value chain risk strategies, cyber/IT-risk, business resiliency and continuity, and pandemic preparedness. He is internationally recognized and has held executive operational and IT risk positions at Booz Allen Hamilton, Chase, Prudential, and Ernst & Young. He is a pioneer in helping companies use his leading-edge methodology to transform their risk management programs. Gary is the author of At Your Own Risk (Wiley) and has appeared on NBC Nightly News, Bloomberg TV, ABC, and CNBC, and has been published in CEO Magazine, Shanghai Business Review, and CIO Insights. We Can’t Change the Past, but . . . Can We Change the Future? Can You See the Icebergs Ahead? Why Does the Organization Need to Identify a Supply Chain Risk Paradigm? Why Is Production So Critical?